Coffee, Bees and Climate Change Are Linked In Ways You May Not Have Expected : The Two-Way A new study projects that by 2050, climate change could reduce the amount of ground usable to grow coffee in Latin America by up to 88 percent. Bees play a key role in increasing coffee yields. A coffee farmer picks fresh coffee cherries in Colombia. New climate research suggests Latin America faces major declines in coffee-growing regions, as well as bees, which help coffee to grow. Pollinators such as bees play a key part of producing the beans that go into your morning cup of coffee. In fact, they are responsible for about 20 to 25 percent of coffee production by increasing the plants' yield, Taylor Ricketts, the director of the University of Vermont's Gund Institute for Environment, tells The Two-Way. Bees actually increase the quality of the beans by making their size more uniform. But climate change is threatening both pollinators and the areas where coffee can grow. A new study published in Proceedings of the National Academy of Sciences says it is the first to model the impact of climate change on both coffee and pollinators. The researchers projected that by 2050, climate change could reduce the amount of ground usable to grow coffee in Latin America by up to 88 percent. That's significantly higher than previous estimates. "We've known for a while that climate change is going to mess with agriculture in a lot of ways," says Ricketts. It will move the areas where both coffee and pollinators live – but not necessarily in the same way. "These are all individual species that happened to co-occur now," Ricketts says, but they each have different tolerances to heat. For example, a bee that is at the very edge of its heat tolerance won't follow coffee into warmer areas. Ricketts says the researchers wondered: As the land suitable for growing coffee moves and shrinks, will pollinators "exacerbate this problem with coffee and climate change or soften the blow?" Using computer models, they found that it was a bit of both. Most coffee growing areas are expected to see a reduction in the number of bee species – though about 16 percent of the areas will see more diversity. 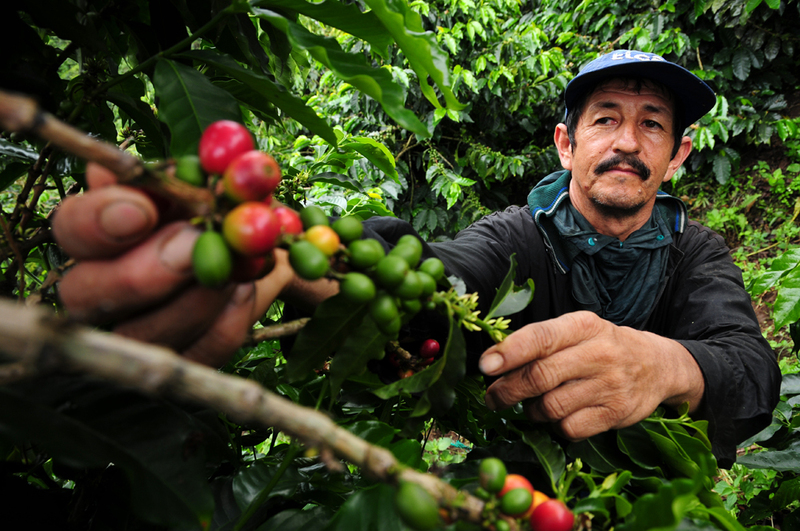 The areas expected to lose the most coffee growing land are in Nicaragua, Honduras and Venezuela. A few areas are actually expected to see slight expansion of land that is suitable for coffee growing, in Mexico, Guatemala, Colombia and Costa Rica. "We're going to lose a lot and not gain too much," he says. Climate change will, in places, have opposite impacts on ground suitability and bee diversity. The researchers project that about 34-51 percent of areas will become less suitable to growing coffee but see more bee diversity, somewhat offsetting farmers' losses. The opposite is true in 31-33 percent of future coffee distribution areas. Ricketts stresses that this is not just a discussion about a luxury item, because it is grown by millions of people on small farms in rural areas. "There is a whole lot more at stake here than, is my nice espresso in New York going to get more expensive? Climate change is going to threaten this primary livelihood for millions of people in vulnerable communities all over the world." Focus on maintaining habitats for wild bees in coffee-growing areas, especially those that are new due to climate change. In a warming climate, growing coffee under shade trees can both cool the beans and provide habitats for pollinators. In areas where it is no longer possible to grow coffee, farmers may need assistance transitioning to another kind of crop.